With 2.3 billion active social media users in the world, you can bet your citizens are using social media to learn about opportunities available in their community. To help you leverage the power of social media, we’ve compiled 19 tips for promoting your parks and rec activities using a variety of social platforms. Download our free fact sheet. 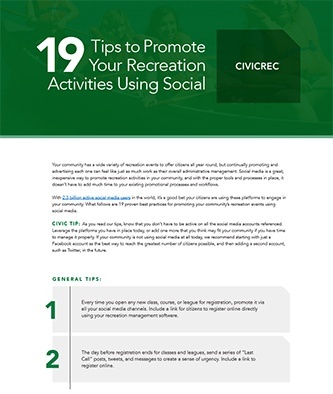 Download our free fact sheet to learn best practices for promoting your community activities, classes, leagues, and events on Facebook, Twitter, Google+, Instagram, Pinterest, and LinkedIn.